From what age kids are allowed in escape rooms? Over the past few years, the escape rooms have become extremely popular all over the world because they offer exciting and high adrenaline games in which everyone can show logical thinking, speed, and have fun together with friends, family or team. In every city there are at least a few escape rooms that await their players who want to get out of their comfort zone and to experience many positive emotions revealing mysteries, solving riddles, saving the world, finding the murderer or discovering pirate treasures buried thousands of years ago. The experience in such rooms is so exciting and filled with emotions that many parents are interested in whether they can make their children happy with a game in an escape room in which the little ones have a lot of fun, revealing mysteries with their friends. If you are considering whether to gift your child an hour filled with emotions in an escape room, then you have to know that the escape rooms have minimum age requirements. From what age kids are allowed to enter the escape rooms? Each escape room has requirements regarding the participation, specifying the minimum age to enter the escape room. Usually, the minimum age requirement varies from 10, 12, 14 to 18 years old depending on the degree of difficulty of the game, as under this age, the individual participation of children is not allowed in any escape room. What are the reasons not to allow small children to participate individually in the game in the escape rooms? Even if the puzzles are intended for children, they are complex and require logical thinking, concentration and rapid reactions, that are not yet developed in small children. Until the age of 4 – 5, the child experiences difficulties concentrating for a long time, also finds it difficult to make decisions based on logics and overcoming obstacles, so to solve the puzzles within an hour, if not impossible, is very difficult for the kid (except if the kid is with an adult). If the small child is allowed on his own in the escape room he might get scared both from being closed (to experience claustrophobia attack) and from the decor of the room. Falling into a completely unknown place that pulls them out of their familiar comfort zone, disturbs the little children and it may cause them an emotional trauma and frustration. The games in the escape rooms last for one hour, as this is a long period of time for the small children, in which they have to be closed and alone in an unknown place without their mother and father. In addition, the kids can’t concentrate so much that the game doesn’t lose its attractiveness for them, and not make them try going out and looking for their parents. Let‘s also not forget that the décor in the escape rooms may be dangerous for the small children who may get injured during the game. In the escape rooms people have to overcome many obstacles, they have to arrange puzzles, find hidden objects, unlock doors and so on, and the small children haven‘t reached this maturity where they could handle the challenges on their own. While the children are in the escape rooms it is also possible for them to get disoriented, and this scares and frustrates them to the extent that they can experience a panic attack. As we have already mentioned above, each escape room has its own rules determining the required age for children. 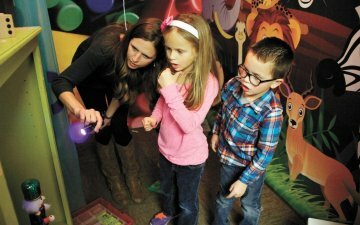 Depending on the story of the game, in some escape rooms are allowed children over the age of 4, but only if the kid is accompanied by an adult. 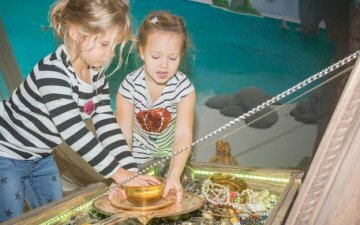 In the escape rooms of Lucky Bansko, for example, children aged 4 to 12 can play only with an adult companion. 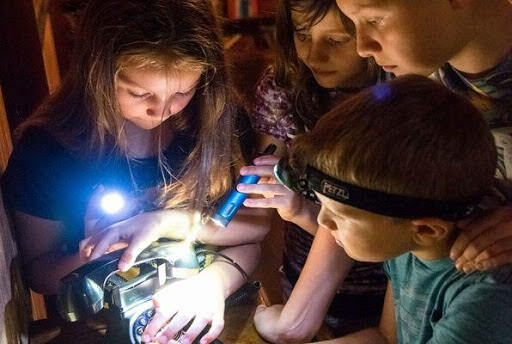 The imposed requirement for children aged 4 to 12 not to participate independently in the solving of mysteries in Lucky Bansko exists, because although the escape rooms are not dangerous, the resolving of the mysteries requires logical thinking, concentration and emotional maturity. In both story lines of the escape rooms in Lucky Bansko – Hacker room and Egypt room the players have to solve the riddles quickly, they have to overcome various obstacles and to solve mysteries, so small children are not yet able to deal with these situations on their own. What would happen if the child goes into a room like that? Since the requirements of the escape rooms are clear and very small children are not allowed to play on their own, then their companion has to take care of their safety by supervising each movement they make on the way to solve the puzzle. The responsibility for the children is entirely on the adult who has made the decision that a small child can stay for an hour in a closed room, without wanting to go out. However, if the child wants to go out or gets upset, the game stops and the child immediately leaves the escape room. In the escape rooms of Lucky Bansko the personnel takes care not only for the entertainment, but also for the safety of the kids during the game. There is no doubt that the fun offered by the escape rooms is an irresistible temptation both for adults and children, but as you can see, there is a completely logical reason due to which there is a requirement specifying the minimum allowed age for the players. So, if your child is still very young, wait a little before showing him the incredible world of these puzzle rooms, or at least accompany him in order to be sure that the closed room filled with strange objects will not upset or frustrate the kid. Even then, before you reserve the escape room, request information about the story and the conditions of the specific mystery room in order to be aware both of the required minimum age and of the puzzle that the child has to solve. If your child is over 12, then you can surprise him with this exciting experience in some of the escape rooms of Lucky Banko or in some of the escape rooms in your city. Escape rooms at Lucky Bansko left us an unforgettable winter memory! We cannot wait to organize our next winter vacation here again with the kids! It was a wonderful adventure! We have traveled a lot but we don't have much of escape room experience so far! Thanks to the escape rooms at Lucky Bansko, we actually consider going for more! We went out in 35 minutes! Extreme adrenaline! Special thanks to the organizers, the decor and the atmosphere were great! Disabled wheelchair access is provided.